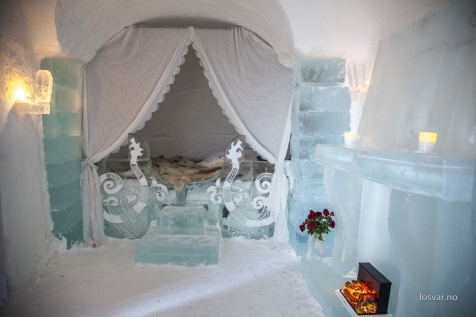 Why not enjoy a Suite at the Igloo Hotel? Fly to Alta (via Oslo). On arrival self-transfer to the Scandic Hotel Alta. The hotel is situated opposite the titanium-clad Northern Lights Cathedral which, when lit up, forms a stunning backdrop against the Arctic skies. This evening you will leave behind the city lights in search of the Aurora Borealis. Your guide will travel along the coast, fjords and inland in search of clear skies and a glimpse of the dancing ribbons that flicker across the heavens. He will also be on hand to offer assistance in capturing this natural phenomenon on your camera. 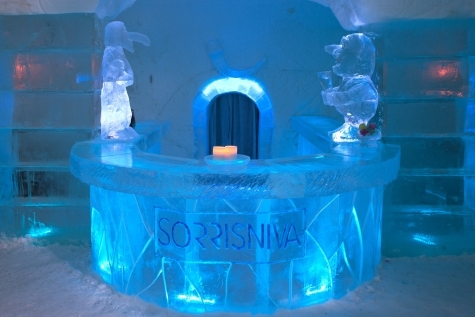 After breakfast you will transferred to the Sorrisniva Igloo Hotel. 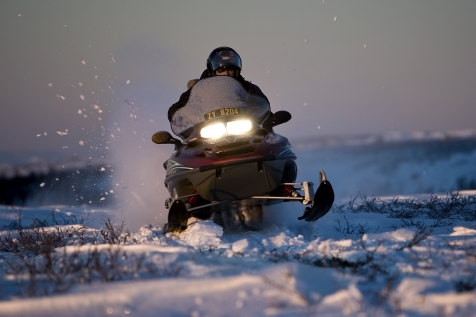 The day continues with an exciting snowmobile safari where you will follow a former trading route, across the vast snow covered plateau in one of the last wilderness areas in Europe. Enjoy a leisurely afternoon in these idyllic surrounds, where you can walk, go for a kick sled ride of spend some time in the outdoor hot tub gazing at the starry skies. 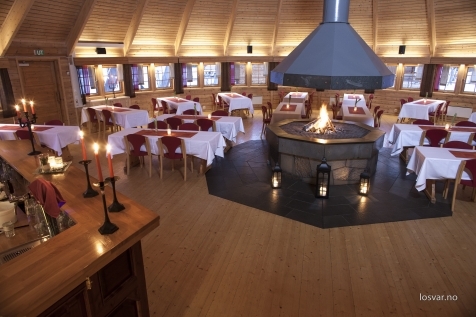 Dinner is at Laksestua, a wooden building shaped like a traditional Sami lavvu, complete with open fire. Here, the chef will prepare you a delicious 3-course meal – Nordic cuisine at its best. You will then retire to your snow room and a comfortable night wrapped in reindeer skins and the warmest of sleeping bags. 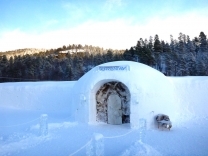 The building of the Sorrisniva Igloo Hotel begins as soon as the first snow falls and this year, its 16th, the doors will open on the 6th January 2016. 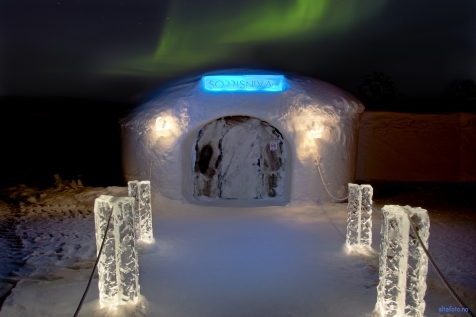 There are just 30 rooms, an ice lounge and bar, a themed sculpture gallery and an exquisitely decorated chapel. The temperature inside the igloo remains constant (between ˉ4°c and ˉ7°c) but the natural reindeer hides, mattresses and sleeping bags will keep you warm throughout the night –although we do recommend you wear thermals and perhaps, a woolly hat! This is a popular choice for those looking for a convenient and centrally located hotel. Just a short walk from the town’s shops and restaurants, it also enjoys stunning views of the Northern Lights Cathedral. Modern Scandinavian style rooms have all the facilities required for a comfortable stay including free Wi-Fi and tea & coffee making facilities. It is also the meeting point for many of the excursions starting in the town. Snow shoeing is a fun and easily mastered activity. Snow shoes have long been used to delve into the wilderness where the deep snow makes other forms of transport impossible to use. Explore this snow-covered Arctic landscape and Alta forest’s with your expert guide. Try your hand at ice-fishing, which if you are lucky, can be cooked for lunch prepared over an open fire at the wilderness camp, just outside Alta. The oversized tyre design of a fatbike means that it is possible to cycle year round on all sorts of terrain – including snow. This daytime trip will follow may of the scenic dog sledding and snowmobile trails that surround the Alta valley. Stops are made en-route at a rustic shelter so that you can really appreciate the wilderness that you are in. The guide will light a fire, whilst you enjoy some fortifying hot drinks and snacks, before returning to town. The length and level of the trip will be based on the participants fitness level and cycling experience. Bike rental, helmet, head torch and a light meal grilled on an open fire in one of the valley’s many rustic shelters are included. Learn from a master! Eirik is a veteran musher and dedicated to his 90 Alaskan huskies. Visit Eirik and his close knit team and together they will pass on their extensive skills. After full instruction, you will mush in pairs, taking it in turns to drive along the Alta River and through the nearby forest. Stop for hot drinks along the way and the chance to chat to your guide to find out a little about life as a dog musher and breeder. Enjoy a short afternoon drive outside Alta to Eirik’s husky lodge, where the veteran and his team will instruct you how to control the sled and dogs, before you head off into the wilderness beyond. Travel in pairs - one seated on reindeer skins in the sled, and one driver, swopping half-way. If you don't want to drive, the guides will do it for you. Headlamp torches will help navigation if the afternoon or moon's light is not enough. Returning to the kennel, you'll have the chance to take pictures and warm up with a hot drink.